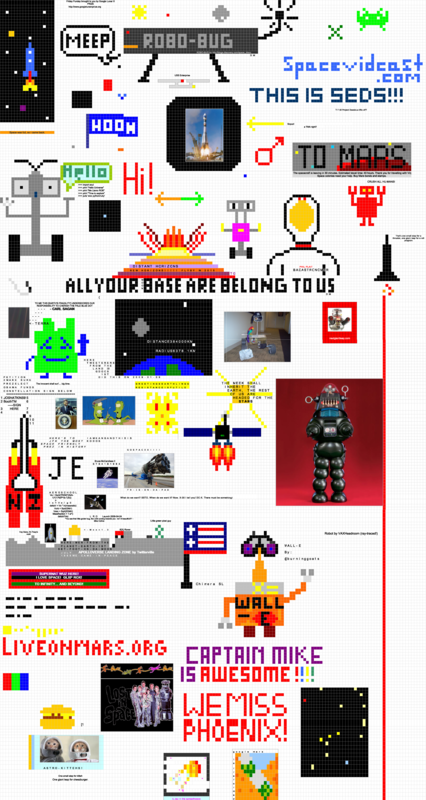 In what might just be the most participated-in Friday Funday ever, we took a cue from a really awesome YouTube video and did some collaborative space art..... using Google Spreadsheets. It's difficult to tell exactly how many people participated, as some chose to draw anonymously. But there were 33 authenticated users that participated (according to the versioning system). I'd estimate total participation at well over 50, maybe much higher. The links that were sent around on Twitter topped over 500 clickthroughs. Without further ado, here is what the community created. Click here for the full-size image (1.5mb). Trust me, you'll want to download to get the full effect (especially the tiny text). I should have a short video coming soon of the work in progress. We need to do this more often, that was fun. You should make some of this art into t-shirts. Or even have a t-shirt design contest using this method. I would totally buy a pixelated glxp shirt! pretty sure the download link is working now. if it's not, please comment. as for t-shirts: a number of people have requested that, actually. the image is so detailed, though, that if i put it on a t-shirt you'd hardly see anything. the design contest might work, though, especially if there were specific limits. i'll consider that.